Content marketing continued to prove its value in the online marketing realm as more and more major brands have added it to their traditional marketing strategies in an effort to reach their target audiences. 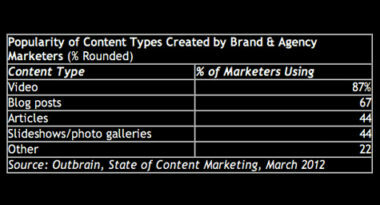 This was the conclusion of the Outbrain State of Content Marketing 2012 report, which surveyed senior-level brand marketers and agency executives regarding their experiences with the effectiveness of content marketing. MediaPost.com reported on their favorable findings. According to the report, 100 percent of the marketers surveyed utilized content marketing in their marketing strategies, with 87 percent citing video as the most frequent content they create. After video content, marketers were likely to use blog posts, articles, and photo galleries as part of their content marketing efforts. In terms of measuring the success of content marketing, 89 percent thought the best indicator is social media engagement, while 76 percent cited the number of views and downloads, and approximately half credit the amount of leads generated and referrals from search. Last year’s survey showed that only 66 percent of respondents considered social media engagement to be a success indictor, which shows its growing importance among marketers. Social media continued to show its dominance as 96 percent of respondents reported relying on social media to drive traffic to content, followed by 78 percent who used paid search, 76 percent who used display advertising and 69 percent who used SEO for content distribution. Social media, video advertising, and content marketing were all deemed the most effective marketing tactics for creating brand awareness, consideration, and affinity. Finally, 82 percent of brand and agency marketers planned to increase their content marketing efforts throughout the year. At MDG, our 360° marketing approach uses just the right mix of traditional and online media to reach your marketing goals. While some industries may fare better on TV and others online, we strive to create a balanced approach where digital and traditional marketing efforts support each other and your message is tailored to the medium.